The Chronicles of Amoronia: Stylish Blogger Award! 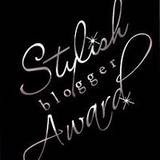 I am very excited to have been given the Stylish Blogger Award by my friend Anna, the stylish blogger of Annuk Creations! Thanks so much my dear friend, this was indeed a lovely surprise, and a great start to this new year! 1. I am a light traveller. 2. I can't live without tea! 4. My resolution for the new year is to recycle more. 7. I totally love books and stories! Ha! Thank you darling! I appreciate that very much! It's a real pleasure to share this Award with you! Oh I LOVE LOVE LOVE seeing it travel to other lovely bloggers!!! thnks so much for this! Congrats!Good to know a bit about you! But if you want to start linking back to things, you could copy the address on a page, go back to where you are preparing your post, select the text that you want to link back to, and then click on 'Link' or the link icon. It should open a little space where you can paste the address you have copied, and then click OK. That's it! Kisses! And it was one of your best posts today! THANK YOU SO MUCH, IT'S FANTASTIC!! I LOVE YOUR NEW PIC!